Founded in 1957 to provide a permanent home to the popular Pebble Beach Road Races, Mazda Raceway Laguna Seca will be hosting the full Mazda Road To Indy finale for the first time this week. The 542 acre world-class racing facility is located just north of the Monterey-Salina Highway and was carved out of the southeast portion of a now decommissioned Ford Ord. First opened in 1917, Camp Ord (later Ford Ord) was home to a major basic training center for thirty years and also hosted an active artillery range. Since 1957 the track has been operated and maintained by The Sports Car Racing Association of the Monterey Peninsula (SCRAMP). SCRAMP is a not-for-profit organization that includes a volunteer board of directors and thousands of volunteers. All proceeds earned by SCRAMP are donated to local charities and organizations. Originally a nine-turn, 1.9 mile natural terrain road-course, the circuit was reconfigured to the now familiar 11-turn 2.238 mile circuit with the addition of the Andretti Hairpin and the Turn 3 and 4 infield section. The Sports Car Club of America started sanctioning Formula A (later Formula 5000) contests in 1967 and the popular open wheel series made it’s first appearance at Mazda Raceway in 1968 with Lou Sell winning the 53 lap contest in a Smothers Brothers sponsored, Chevrolet powered Eagle Mark 5. Other Formula A and Formula 5000 winners at Mazda Raceway include familiar names: Sam Posey, David Hobbs, Graham McCrae, Jody Scheckter, Brian Redman, and Mario Andretti. The earliest record of an open wheel ladder race at Mazda Raceway that TSO could find (there was surely Formula Junior or other SCCA races contested before that) was the seventh and final race in the first Super Vee national championship in 1971. The race and championship were won by future Indy Car driver Bill Scott. Formula Atlantic in all of it’s various iterations made it’s first of 31 appearances at Mazda Raceway as part of an IMSA GT weekend in May, 1976. The entry list included 46 car and driver combinations, with 32 cars taking the green flag for the 33 lap race. Future Formula 1 star Gilles Villeneuve won that race and the 1976 IMSA sanctioned Formula Atlantic championship. The winningest Formula Atlantic driver at Mazda Raceway was Mark Dismore. The Greenfield, Indiana native won five races on the hilly road course that is almost 2000 miles from his home in central Indiana. Price Cobb, Johnny O’Connell, Jimmy Vasser, Jacques Villeneuve, Alex Barron, Dan Wheldon, Ryan Hunter-Reay, A.J. 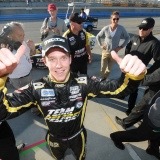 Allmendinger and James Hinchcliffe are other familiar names to win Formula Atlantic Races at Mazda Raceway. The Atlantic Championship ended the season at Mazda Raceway a dozen times. A number of those finales featured memorable moments. In 1991, Jimmy Vasser held a three point lead in the SCCA Toyota Atlantic Championship entering the double header finale at Mazda Raceway, but was outscored 28 to 22 by Jovy Marcelo to end the season trailing the popular Filipino driver by a slim three point margin. Current sports-car stars Jon Forgarty and Ryan Dalziel waged an epic back and forth battle for the 2004 Toyota Atlantic Championship Presented by Yokohama. Fogarty held a slim five point advantage entering the final race, and was able to cruise to victory after Dalziel was assessed a drive-thru penalty for jumping the start by just the slightest of margins. In 2009, Simona de Silvestro held a seven point lead over Jonathan Summerton and 10 point lead over John Edwards heading to the Cooper Tires Presents the Atlantic Championship Powered by Mazda finale, but had contact with 2008 champ Markus Niemelä in the corkscrew on the first lap of the race. The contact needed de Silvestro’s day and championship hopes and she ended the year in third place behind winner Edwards and runner-up Summerton. Here is the contact between de Silvestro and Niemelä. Championship Automobile Racing Teams, better know as IndyCar, began a 22 year run at Mazda Raceway in 1983 when Teo Fabi won his first race in America while driving a Cosworth powered March for Gerald Forsythe. The Other “Indy Car” winners in Monterey County include: Bobby Rahal (4 times), Danny Sullivan (2 times), Rick Mears, Michael Andretti (2 times), Paul Tracy (2 times), Gil de Ferran, Alex Zanardi, Jimmy Vasser, Bryan Herta (2 times), Helio Castroneves, Max Papis, Cristiano da Matta, and Patrick Carpentier (2 times). The American Racing/Indy Lights Series existed under CART sanction for 16 years and held events at Mazda Raceway Laguna Seca all 16 years from 1986 trough 2001. The historic Mazda Raceway was the site of the season finale half of those 16 years. Fabrizio Barbazza won the first Indy Lights event in 1986 and Townsend Bell won the last race in 2001. Other notable Indy Lights race winners at Mazda Raceway include: Scott Dixon, Cristiano da Matta, Tony Kanaan, Greg Moore, Andre Ribeiro, Bryan Herta, and Johnny O’Connell. Unlike this year’s Indy Lights presented by Cooper Tire championship which features three drivers who have a good chance to win the Mazda Motorsports Advancement Scholarship, the previous eight finales did not feature a close championship battle. The list of Indy Lights champions who won at Mazda Raceway the same year they won the championship includes only five drivers: Barbazza (1986), Herta (1993), Moore (1995), Dixon (2000) and Bell (2001). Unfortunately, TSO could not locate any old Indy Lights broadcasts on YouTube. 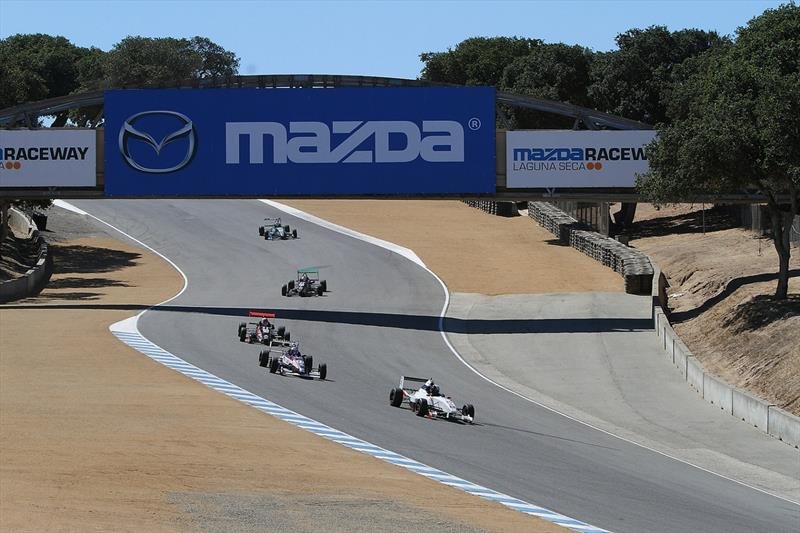 It’s been three years since the Pro Mazda presented by Cooper Tire championship has visited Mazda Raceway Laguna Seca. However, in the past the distinctive Mazda Renesis rotary engine note was a familiar sound echoing off the hills of Monterey County. The Star/Pro Mazda Championship made 13 visits to the track between 1998 and 2012. The double header in 2012 was memorable for two reasons. First, current Verizon IndyCar Series driver Jack Hawksworth won the first race of the weekend to secure the 2012 title and a ride in the 2013 Indy Lights. Second, a victory in the second race of the weekend was the first time that current IndyCar Sunoco Rookie of The Year, Gabby Chaves, stood on the top step of an Mazda Road To Indy podium. 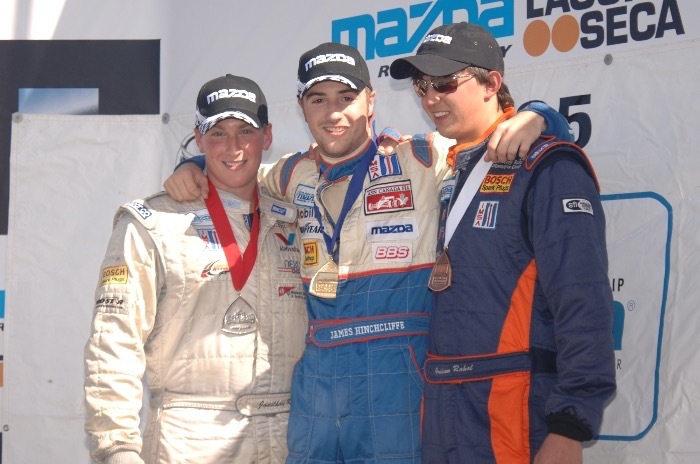 Current Juncos Racing Pro Mazda technical director and race engineer Peter Dempsey entered the 2009 Star Mazda finale with what looked like an insurmountable lead over Adam Christodoulou. Dempsey scored his fifth pole of the season and only needed to come home in seventh to win the championship. Dempsey got a poor start and fell back to third place before being rear ended by Joel Miller on the first lap and falling back to the rear of the field. The Irishman made a valiant come back, gaining 12 spots before making contact and retiring while battling Rusty Mitchell for 10th place. Other Star/Pro Mazda race winners include: Ian Lacy, Grant Ryley, Marc DeVellis, Moses Smith, Luis Schiavo, James Hinchcliffe, Ryan Justice, Ardoin, Richard Kent, Christodoulou, and Connor De Phillippi. Since being reborn in 2010, the Cooper Tires USF2000 powered by Mazda championship has made two trips out west to contest a total of four races at Mazda Raceway Laguna Seca. In 2010 it was Verizon IndyCar Series rookie Sage Karam who was the quickest, but it was Scott Rarick and Mikhail Goikhberg who were victorious. The second visit for USF2000 occurred in 2013, where Alexandre Baron was a winner of race #1 in his first Mazda Road To Indy appearance. Race #2 saw eventual series champion take home the victory and solidify his spot at the top of the standings with two races left. Other open wheel series that have contested races at Mazda Raceway include the: Barber Saab/Dodge Pro Series, Formula BMW, and A1GP.